The IKEA Bekant desk has been a problem-plagued product from the outset, with extremely poor ratings from IKEA's own customers (2 stars last time we checked at IKEA ). With a weak 150-lb lifting capacity, a surprisingly light frame, and only one desktop size available, this desk comes in at the low end of electrically adjustable sit/stand desks. Consistent user reports of DOA failures or, in the best case, failure after a few days or weeks of use, compel us to give this product an unprecedented half-star rating. Varies by Zip Code, or pick up for free if you live near an IKEA store. For the greatest assortment of color options purchase online as inventories may vary by location. Extremely cheap in basic configuration. 10 year warranty. Eerily consistent user reports of field failures within days or weeks of installation. The Bekant's specs are disappointing, to say the least. The meager 150 lb maximum lift capacity is insufficient to counter the side loading on a typical user's computer workstation. 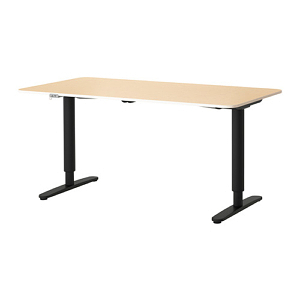 The base is designed for a 63" desk width; if you want a narrower or wider desktop, you're out of luck. Definitely not recommended for taller users or treadmill desk users, given its limited 48" top reach. When exceptionally good electric desks are available for only $170 to $200 more - with tabletops that'll look better and perform better over time, and come in many more sizes and colors - we don't see enough value in IKEA's latest offering to recommend it to our readers. While its new reduced $399 price might seem alluring at first glance, its poor specs and low weight make it a weak contender in its category. The Bekant might save you money now, but you may find yourself going through the hassle of replacing the desk in a few weeks or months, based on consistent user reviews. Even on IKEA's own website curated customer reviews sum up to 1.8 stars, which says it all. Our opinion? You’re better off paying a bit more now for a quality desk that uses sturdier and more reliable components. Editor’s Note: Our review of the IKEA Bekant sit-stand desk has been revised multiple times since our first write-up in February of 2015. With each revision we’ve had to lower our rating due to persistent reports from customers who purchased the Bekant only to have it fail, if not out-of-the-box, within weeks of installing the product. We’ve had to lower the rating all the way to the unprecedented bare minimum of 0.5 stars over time, given the consistency and persistence of these negative user reviews. In our experts’ opinion having reviewed dozens of adjustable height desk products, IKEA should recall this product. We’ve been saying so for the past three years. As we’ve stated from the outset based only on the published specifications, the motor and power supply system on this desk is severely under-powered for the application. Field reports have verified this fact beyond any doubt. While IKEA has a very strong consumer following, and people want to believe that a reliable adjustable-height desk can be made for this end price, our early predictions about the Bekant’s inadequacies and likely weak points unfortunately came true. Independent of our review or any other review site’s rating of the IKEA Bekant Standing Desk, IKEA’s own website (as of May 10, 2018) shows 87 user reviews with an average 1.8-star rating, with many of the user comments reflecting the same issues our staff experts found, and many burned customers making emphatic pleas to prospective shoppers to avoid the product. Keep in mind that these reviews are curated by IKEA marketing staff, no one else. The company’s response to the product’s failure has been to drop the price $100, not to remedy it’s flaws. Beware of blog sites that have provided a non-expert positive review of the Bekant in exchange for a free product. If you don’t trust our expertise you at least owe it to yourself to read what IKEA’s own verified customers write about it. Until such time as IKEA discontinues the Bekant, our sister company, SitLess, is offering a $50 discount on any new desk purchase – any manufacturer, any model – with proof of prior purchase of a Bekant desk (US only). To take advantage of this limited-time offer, call the store at 844-366-8748 to place a phone order. Or, order your new desk online and send a scan of your IKEA receipt to [email protected], reference your order #, and they will process a $50 refund to your credit card. Note: IKEA has recently added a new, higher-tier electric standing desk called the Idasen. Be sure to check out our complete IKEA IDÅSEN Standing Desk Review and our separate review of the IKEA IDÅSEN Standing Desk Underframe. IKEA, known around the world for its mass-produced, low-priced furniture, has re-entered the U.S. standing workstation marketplace with an electric adjustable height version of their Bekant desk (they haven’t sold their Galant line of electrically adjustable standing desks in the U.S. for several years). If you’re looking for an affordable stand up desk, the Bekant might work for you. But before you run out and buy one we encourage you to read all the user reviews at the end of this expert’s review. If you’re looking for a long-lasting solution, we think you would be better off investing slightly more money in a higher quality adjustable height desk that will look better and last for many years, not a few weeks. 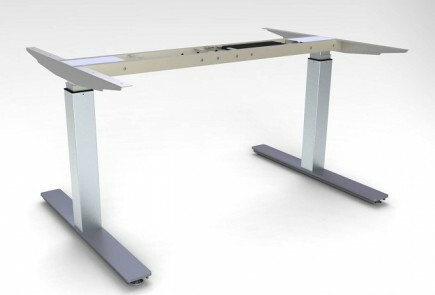 Since they introduced the Bekant stand up desk in late 2014, we haven’t been able to see the Bekant standing desk in action. So far, the desk has only been available in select IKEA showrooms around North America. Nevertheless, we managed to glean some interesting facts about the Bekant from the information available on IKEA’s site and from a plethora of early adopters’ online reviews. This review is therefore conducted under our process for forensic product reviews. What exactly can you expect if you buy this desk? Short answer: a typical IKEA product strategy of cutting corners on components in order to achieve an extremely low price point. Most of us here at WorkWhileWalking are more than a little familiar with IKEA, having purchased, assembled, and in some cases subsequently replaced some of their furniture that didn’t stand the test of time. IKEA designs their products to be as low-cost as possible. Raw materials are typically cheaply sourced, and many of the components are mass-produced in IKEA’s factories. Furniture is kept in flat boxes to save on shipping costs. Most notably, Ikea sells their furniture disassembled, saving storage and labor costs by relying on customers to put together their table or bookcase themselves. These furniture pieces, once assembled, often develop problems before long – components become loose and wobbly, wood warps, laminates wear at the edges, screw holes disintegrate. The furniture is meant to stay in one spot, so moving houses can exacerbate these problems even further. Now, we don’t mean to cast aspersions on all IKEA products; this has just been a common experience for many users who have posted online reviews in the past, and it may not necessarily hold true for this particular stand up desk. That said, we have been able to acquire and test many other desks in the same price range, some good, some not so good, also reviewed on this site. The bottom line is until we can actually test the product in our labs we can only go by specs, photographs, and voluminous user reviews we were able to find online. And from what we see, the Bekant (along with the Autonomous SmartDesk) is the cost-cutting leader, but they clearly went a bit too far in the name of competitive pricing. For the gap in price between the Bekant and other desks we’ve tested in the same price range, the minuscule savings don’t seem worth the hassles that disenchanted customers are experiencing. The Bekant Sit/Stand desk frame is a simple affair. The desktop is what we’ve come to expect from IKEA: a lightweight slab of particleboard with an inexpensive veneer or lacquer finish and PVC edging. Certainly not state-of-the-art 3D-laminated tabletop product, but we wouldn’t expect that from IKEA. The Bekant offers a very limited tabletop color selection of birch veneer, black, white or grey, paired with either a white or black base. IKEA seems to have taken this same cost-saving tack with their $399 base, as well. The Bekant base, which we learned is manufactured in Lithuania, adjusts with a no-frills up/down controller with a locking key. The desk has an upper reach limit of only 48″, which while meeting the ANSI/BIFMA US government standard for sit-stand desks, is not going to work for anyone over 6’2″. Moreover, it will likely be shaky for anyone over 5’11” where the telescoping leg segments have insufficient overlap to maintain optimal rigidity. Most good bases these days exceed the ANSI/BIFMA limit by two to seven inches, to ensure stability for tall users (as well as treadmill desk users). But if you’re cutting corners, less metal in the legs and feet saves on material and shipping costs. We were surprised to see that the specified weight of the base was a mere 57 lbs. Most electric stand up desks have heavy-duty bases that weigh between 70 and 100 lbs. The lighter weight could be a consequence of the lighter-duty motors used in the Bekant, or that the steel used in the base frame is of a thinner gauge than other, more rigid desk bases, or both. Either way, we have our misgivings. As a rule of thumb, heavier bases are more stable and reliable. The many user reports of motor failures in the field adds weight to our staff experts’ initial opinion that the motors are severely under-powered for the application. The base legs are round, which some people find more aesthetically pleasing in a home decor than the much more common rectangular legs. The reason most manufacturers use rectangular legs in their electric bases is to increase the longitudinal stability of the desk (front-to-back wobble), so this is a slight trade-off of form versus function. The Bekant has one of the weakest lifting capacities of any electric desk we’ve seen, with 150 lbs maximum lifting capacity. We’re used to seeing electric desks with lifting capacities upwards of between 220 and 490 lbs, and we’re concerned by the seemingly low power of the Bekant’s motors. Most stand up desks offer users a variety of sizes, but the Bekant Sit/Stand base only comes in a single size, meant for their 31.5” x 60” table top. If your home or office doesn’t accommodate that size, you’re probably out of luck (though you could by the Bekant Sit/Stand base alone and add your own desktop). In contrast, other bases in this same price range offer telescoping width frames that can be adjusted to support a tabletop anywhere from 42″ to 83″. The Bekant also has a published total width of 57.5”. There isn’t a measurement available for the width of the desk base’s feet, but most desk feet are close to 3” wide. Using that number as an estimate, we believe there’s about 51.5” of space between the Bekant’s legs, a good deal less spread than would be needed to fit a standard office chair next to a walking treadmill. For this reason, the Bekant is not suitable for sit-stand-walk configurations. Without the taller reach or leg extensions offered on other electric desk bases all but the shortest of users are likely to have a shaky setup, if they can reach the keyboard at all, once a walking treadmill base is added underfoot. 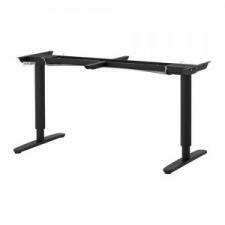 If you’re looking for an adjustable height desk for use as a treadmill desk our advice is spend a couple of hundred dollars more for something that will give you the reach and stability for a good user experience. The only good news in all this is that the IKEA Bekant is backed by a 10-year warranty. IKEA’s guarantee to replace your desk should it fail out in the field is the Bekant’s saving grace. It comes down to whether the lower cost of the Bekant is worth the very chance – based on consistently negative user reviews – that you might someday be taking it apart, hauling it back to IKEA and replacing it with a new desk should anything go wrong with the motors. Budget-conscious desk users will no doubt be drawn to IKEA’s popularity and cost-saving manufacturing and stocking methods. But from both our own past experiences with their products, and from what we’ve learned about the Bekant during the course of our research, we don’t think IKEA’s philosophy fits well in the sit/stand marketplace. Stand up desks – which have telescoping legs, precision motors, power supplies, and intricate gearing and transmissions – are more complicated than a chair or a bookshelf, and therefore require more consideration for their reliability and performance. As such, we think there’s a good chance you’ll find yourself needing to replace this desk after just a year or two. Combine that fact with its poor specs and low weight, and the Bekant’s alluring $489 price ($399 for just the base) starts to lose its luster. You might save some money now, but is it worth it if you find yourself going through the hassle and additional expense of replacing the desk in a few years? We don’t think so. Given that there are quality standing desks using sturdier and more reliable components available now for just $100 or $200 more, we’d say you’re better off paying a bit more now for a stand up desk that will last longer. What would we recommend over the Bekant, if you’re looking to save money on an entry-level stand up desk? The least expensive electric desk with an excellent rating is the American-made iMovR Energize, which will give you more than twice the lifting capacity, ultra-quiet motors with 220 lb lift capacity, an industry leading ten-year warranty, and a much wider selection of tabletops featuring advanced 3D lamination, fully-sealed grommet holes and a much more durable and visually striking color pallet, for only about $200 more. 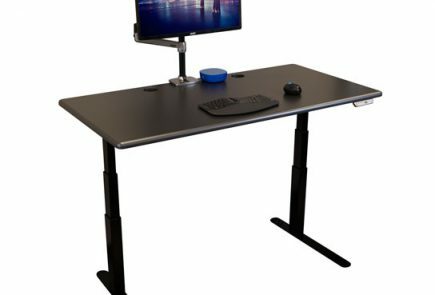 In the same price range are numerous other options from Jarvis, Uplift, StandDesk and others you’ll find in our Electric Adjustable-Height Desk Comparison Review. Worst desk EVER! On my second one and the motor dies after thee months. AGAIN! Now I have to go back yet again to exchange legs/motor. This is so not worth the time and effort to dismantle and re-mantle every time. We bought 12 of these for my office in the fall of 2016. It’s now the fall of 2017. They are very sturdy and we’ve not have any failures or problems. Most in the office regularly switch between sitting and standing several times per day. We’ve purchased many things for my home and office from IKEA over the years and we’ve never had any major problems. With the few issues we’ve had, their customer service at the local store is top notch and have given me replacements, store credit, or a refund in every case. I am looking to get this desk! some people on IKEA reddit said a lot of the issues have been weeded out by now and there are less problems than in 2015/16. anyone chime in with any bad problems this 2017 year in last few months? I bought two ikea standup desks last year, one for my office, one for my home. Both failed just after the one year guarantee ran out (In spain you get 1 year, in UK you get 2 years at least). When the first one failed, the power supply of the second made it work again, so it seems to be a power supply issue. I wrote to the power supply manufaturer (Rolergo) asking where I could buy a replacement, but they didnt even bother replying. The nearest Ikea is 200 miles away. I went there (took a day), but hey said they did not carry this as a spare part, and said my only option was to purchase a new table. These tables fail. Ikea has done nothing to fix the issue. Do not buy under any circumstances. Also, I am 195cm tall. the desk is about 2cm too short at its highest position, especially if you have an antifatigue mat, which is highly recommended if you don’t want to give yourself back and knee problems. This means I have to put bricks underneath it, which not only looks terrible, but makes it unstable and also means that it is to high in its lowest position. If you are tall, don’t get this table. Bought this in Quebec, Canada. I have been using it for 3 weeks and so far the experience is great. It is a solid standing desk, no problem whatsoever. It was easy enough to assemble (I recommend you do it with the help of someone else). If things change and it breaks down in 3 months, I’ll update the review 😉 So far so good. For the price, I’d definitely recommend. It looks good in all black. I have had my Bekant standing desk for 13 months. Up until now no issue but now when I hit the up or down button the power supply green light goes out and it stops moving after a couple of millimeters. Calls to IKEA have gone around and around. I twittered IKEAUSA and they said to reset the desk with 10sec hold of both up/down buttons. No difference. IKEA phone rep says to take the underframe to the local store. Well, they are 2+ hours away. I’m not doing that. Still waiting to hear back from them. My guess is I need to switch the underframe out for a better rated one. Oh and I checked and the power supply (PS) comes from rolergo.com which is also based in Sweden even though the PS is made in China. No idea how to buy just the PS. I would do anything to not have to put up with IKEA phone reps who seem off the bat to not want to help at all. It has convinced me I will never buy anything from IKEA again. They have no idea how customer service should work. They should take an example from Amazon on how customer service should work. Sad because my wife loves shopping there but no way am I taking her there again when it could potentially mean I have to spend 2+ hours each way to replace something. May as well make me fly to Almhult Sweden to replace ti. Purchased ours in August of 2015 for our home office. We rarely raise it. But after less than 6 months it quit working. It took us almost another 6 months to have time to take it apart and drive the hour to the store. (After I went round and round with CS because we had tossed our receipt. FYI- if you use your loyalty card, you can retrieve your receipt.) Returned the whole thing because they happened to be on sale. Repurchased at the sale price. Got it home and now less than 3 months later it’s dead again. And this is after they have been aware of the issue for quite a while. And after many of you are saying they have identified the issue and solved it. We paid $550 this last time. Not exactly cheap. Thinking we will just be returning it for a regular desk this time. Not worth my time and hassle. The desk breaks. It is a known issue with Ikea but they have not issued a recall. On many websites people report the same issue – it only raises incrementally very slowly. This has just happened to my desk after six months of ownership. The solution is to replace the power pack according to many people reporting this issue. Having called Ikea they will not send me just the power pack but want me to bring the legs and motor back to the store for a replacement. Not great customer service. Add me to the list of disappointed buyers. We had the desk for about 3 months before the motor failed the first time. Customer service required me to take everything apart below the desk and drive 1 hr to the closest IKEA even though they are fully aware this is a controller issue. I rebuilt everything today and the desk could rise but wouldn’t go down. Absolutely ridiculous lack of quality control. Mine also got the motor failure issue, multiple times within a year. I exchanged it 3 times within 1 year. First time I brought it back to store, then the second motor failed in 3 months. I called and insisted that IKEA ship the replaced motor to my place so this time I did not go back to store. This third motor worked for 3 months. I called IKEA again and they wanted me to bring back to store again. I will get my money back this time. It’s painful spending so much time and effort on this desk. I would only suggest this desk for people don’t mind carrying the motor part 3-4 times a year to the stores for a new one and reinstall it. Good thing it comes with a 10-yr warranty. You’ll need it! Mine lasted 8 months before the motor failed. Same issue, rises less than an inch, stops, need to wait a few seconds to raise it another inch. I called Ikea CS yesterday and after waiting on hold for half an hour, the rep told me that they are no longer swapping out the power brick as “that doesn’t always solve the problem.” I was told to take the whole base unit, not the top, back to my store to exchange everything. I was still within the 1 year warranty period, so I just returned the base and top and got my money back. I don’t want to deal with additional failures in the future. Went to the store, saw some of these marked 65-75% off in the “as-is” section, curious, I asked them to let me plug it in and test it out, of course, it had the going up issue where it goes up fine for an inch, stops and then doesn’t move but goes down fine.. The associate saw this, went inside and swapped the power brick and boom it went up and down fine, it looks like there are problems with the power thing itself and the only way to fix the problem is to replace it which is hard to do since they don’t sell them. If it were more heavily discounted I would have gotten one. Wonder if leaving the brick unplugged will help? Simply does not work. We bought 9 for our office. 6 are inoperable now. Ridiculous. FIX!? Exchange the transformer connected to the power cord. Most comments in the (heavily negative) review above are completely valid, and especially for use in offices. I would not buy the Bekant for my office, but am very happy to have it in my home. I appreciate the Bekant’s larger tabletop, which is an expensive option on other desks — and which pushes those others well out of the $200 more that the review suggests you need to spend to get a comparable — but much higher quality — sit/stand desk. I have not encountered the wobble problems reported in the review. I’m 6’0″ and I ran the desk up 3 inches past comfortable working height, and it was still adequately stable. At its maximum extension of 48″ (which I personally would never use), there is probably too much wobble for effective use. Reliability is a more serious issue. I have exchanged (via mail) several transformer blocks, and finally the entire unit which did require a drive to the store with a disassembled Bekant. However, according to Ikea, the offending components have been weeded out of the production line, and the 10-year warranty stands. If the Bekant meets your needs for an inexpensive, less-than-industrial weight sit/stand desk with a nice desk size and a substantially less-than-industrial price, the Bekant is a good choice. How can Ikea represent itself as a customer-oriented retail outlet? Our desk has barely been used, and now my wife is very frustrated, and I am, too. I don’t mind tinkering with it if that would help me fix it, but I’m not willing to spend a couple of hours on it with no hope of fixing the darn thing. No more Ikea shopping for me! My Bekant broke almost exactly three months after first purchasing in 12/2015. The desk will lower, but when trying to go up, it moves about an inch, then completely stops, with the light on the power supply turning off like the motor. It will raise another inch after five seconds of waiting. Update: Called IKEA support and their person had heard of this problem before. I suggested they send a new power supply. He didn’t offer any solutions and instead told me my local store would contact me. No further contact, but a week or so later, I received a box from IKEA with the Bekant legs, power supply, and other electrical parts. I swapped only the power supply and the desk works fine again. As someone else mentioned, an interim fix that also works is to leave the power supply unplugged for a period of time, after which, raising the desk is possible again. Oh. What to say? I wished I could have seen the reviews a week ago. I bought this desk last Sunday. Now i am having the same trouble in raising the desk with nothing on the top at all. So it is definitely not about the weakness of the motor. It is just not working. Now I do not keep the receipt (in those days who keep a receipt?) to prove. I wonder what I can do. I have the same problem. About 90-100 days of use (likely an average up and down of 3-4 times per day), and i am now experiencing trouble raising the desk. I would hear the motor mechanism click and then click again when using the UP arrow on the desk controller. It will raise about 1 inch and then die with a second click. In about 5 seconds i am able to try again and can raise 1 inch till it dies for 5 seconds. I found a short term solution in that i can raise the desk w/o interruption when I assist the motor with my own power by lifting the desk while pressing the UP button. The desk lowers without problem. I wasn’t concerned with retaining a receipt when i ordered online because i figured there would be an online history for my purchases. This not the case. No history of my order. I’m not even sure if a receipt came with my shipment or if i accidentally threw it away. I am screwed as I can’t even get warranty w/o original receipt. If anyone has any tips that would be great. BUMMER… worked fine for 5 days, maybe 10 cycles, and then SAME EXACT PROBLEM. Oh yay, drag it back to the store. (hint, help the desk lift up with your arm while pressing the up button, and it will go…so its motor strength problem) This is clearly a defective product, and should be recalled and redesigned. Don’t bother calling: IKEA punishes you by forcing you to listen to a long winded message about product safety, then lets you navigate the 9 department choices, then a 45 minute phone holds only to be connected to a high school dimwit that says bring it into the store. Really? Wrote ikea support via email and ‘suggested’ they just send me a replacement power supply, and they agreed. Got it 7 days later, swapped it out in 10 seconds and now all works great, seems slightly stronger than original. I suspect the problem is a LEAKY TRANSFORMER, that degrades over time…after being plugged into power for a while. Time will tell, but sure beats returning to the store. 10 year warranty, so what the heck. How is it working for everyone ? I was planning to buy it. Is it working and any fix for the up/down motor issues ? Did the replacement work better ? Motor failed ~90 days. Y’know, just in time for the refund time to be up. Spent 1 hour on the phone w/ customer service. Finally when I got someone, they put me back on hold for another hour. Dreading to call back, I put it off for about a month. Second call a month later lasted 30 minutes before I was told to disassemble the desk and take it back to the store. I’m super disappointed I cannot just get a refund at this point and will now probably be dealing with returning my desk legs every few months when it stops working as it appears to do for most! And all I had on top was my modest computer tower and a dual LCD monitor setup. So I don’t consider it over the weight requirement at all. Bought Bekant Sit/Stand desk in the beginning of August. Last week – it started having the same problems as the people above – goes down fine – but only goes up 1 inch at a time. Unplugging it for a few minutes fixes it for a while. Currently, it’s working fine. Weird…..
Love it otherwise – but will probably be taking it back (90 day return policy in the USA). If the desk motor only raises the desk for 1 second and then you have to wait 5 seconds before it will work again, unplug the desk for 10 minutes, then plug it in and try it again. Second set: worked for 2 months then same issue as Paul above: up an inch, pause, up another inch, pause. Ugh. Mine too broke like what Scott and Paul. @paul and @scott, how did you fix it? What was the underlying problem? I’ve owned the Ikea Bekant standing desk for three months now with flawless performance until today. The up / down switch controller appears to be failing where the desk no longer smoothly transports up any further than an inch or so before a reset type of sound emits from the controller. I’ve removed the power cord and plugged it back in just in case this would possibly “reset” the device. Alas… Time for a customer service Ikea visit. I actually love this desk (when it’s working, of course). I attached three monitor clamps supporting three 27″ monitors PLUS a fourth clamp stand supporting a small platform for my telephone. All of the above maximizes actual desk space yielding a good workspace. By clamping everything to the desk itself I have no fear of anything falling based on a foolish accidental but major bump. This is especially important because I took my old 1980’s treadmill apart and placed wheels and handles on it availing easy transport toward and away from beneath the desk for when I’m feeling coordinated enough to work while walking. Fortunately, I have a full shower in the restroom of my office space at my business. And it’s a good thing because what nobody warns about a treadmill desk setup is the sweat you generate even at only 2mph. I’ve worked many ten mile days with this setup and it’s great. But I’ve also needed a shower afterward every time. Oh yeah, don’t forget to install an under desk keyboard. As for connecting things to the desk itself, keep in mind it’s particle board. Using the right hardware to minimize failure is essential. BTW: unlike other Ikea products, assembly was really easy out of the box. If it wasn’t for today’s controller failure, I would give this desk five stars because of the value for the $, ease of assembly, ease of modification, and daily performance. Who needs more than 150 lbs anyway? Lastly, no, the motor isn’t quiet. But who cares? How often are you going to raise and lower the desk on a daily basis anyway? I’ll report again once I have experienced Ikea customer service solution to my problem. I’m having the same issue with my desk where it will only go up an inch. I’ve only had the desk for less than a month. I’m having the same problem. When raising the desk, the motor will run for 1 second, raising the desk an inch (I guess), then the switch/motor is unresponsive for 5 seconds and then it will work again for 1 second. IKEA told me to return the bottom part of the desk. Other than that, I love the desk. Update: I started to take apart the desk so that I could return the legs to IKEA for an exchange. I had unplugged all of the cables and the desk and just for yucks, decided to plug everything in and test the desk. Everything worked! (I had tried unplugging the desk previously but that hadn’t fixed it.) I suspect there is a flaky cable. Try unplugging all of the cables and replugging them in. I unplugged the desk for a few hours and when I plugged it back in, the desk rose smoothly! The desk needs to be unplugged for more than a few seconds. I had it unplugged for about 5 hours simply because I forgot that I had unplugged it. That was yesterday. This morning, it failed again. I will unplug and let you know what happens. 1. unplug all cables and re-plug in: did not work. 2. Take apart desk and re-assemble: worked for a few hours (probably because the desk was unplugged for 30 minutes during dis-assembly). You can get a new transformer (aka “Power brick”) from IKEA to fix the problem. Same problem here after around 1 month. Had it replaced and the replacement now has the same issue after just 2 weeks. I have the same issue now here in Germany, the desk only goes up for a sec and then stops, it goes down smoothly though. I contacted them yesterday and waiting to hear what I will need to do. Too bad I love it and I work on it every day. This is a bummer! Like so many users, after just a month the electric engine hiccups, goes up for 1 second then stops. It takes 10-15 x 1 second iterations to move it up. SO frustrating. It does seem that unplugging it for a while partially mitigates the issue, but clearly not a long term solution. Hopefully Ikea identifies the flaw, something not right in the electric system. I emailed the compay that makes the power supply and they replaced it in a few days. Now it works fine (though I think one leg is slightly lower than the other). The motor is not the problem. As a few others have said, it’s a batch of bad power supply units. Have you actually tried out this desk yet? It’s available at the Portland IKEA store and seemed like good quality, a nice sized table top, and smooth operation up and down as well. I was hoping for an actual hands-on review here. Kyle, we haven’t yet been able to get anyone from IKEA to send us a desk for lab evaluation, nor have we been able to try one at a local IKEA. Inventory is still spotty around the country. That said, as you can see in user-posted comments here, the calls we’ve gotten from readers who’ve purchased the Bekant have so far been very similar to one another. Most notably: excessive shakiness, noisy motors, and within a short period of time the desks will descend smoothly but stop every inch or so on ascent. In our experience this typically is the result of the overcurrent sensor in the motor controller being repeatedly tripped. Three things can commonly trip this sensor: 1) the weight of the tabletop and items on top of the desk exceeds the lift capacity of the motors, 2) there are excessive side loads on the legs, often caused by bowing in the tabletop or a crossbar that has insufficient rigidity to keep the frame “square”, or 3) and this doesn’t seem to be the case here, the user has exercised the desk up and down repeatedly to the point of overheating the motors. Based on our discussions with readers who already purchased the Bekant, and others who checked it out at their local IKEA and decided not to get it, we’d reiterate the same cautionary comments we’ve had all along about this product. A 150 lb. lift capacity sounds like a lot, but it’s not. These lift ratings always assume a perfectly level floor, perfect installation, and balanced loading of the tabletop. Most desks are in fact not evenly loaded. Often they’re back loaded with monitor arms, for example. This causes side loading that a too-weak motor will not be able to overcome. Since most floors are slightly uneven and users either neglect to or are simply unable to perfectly level their desks (can be tricky on carpeting), we always recommend much higher lifting capacities. When there are desks on the market that have more than twice the Bekant’s lift capacity and much more rigid base structures, not to mention much nicer tops, for only slightly more money, we simply can’t recommend this product. The early field failures that are being reported only served to confirm our fears when we first got a look at the spec sheet. I’m also interested to hear if you’ve had a chance to try one out yet. I’m sorely tempted to get one of these. The canadian reviewer makes an excellent point about delivery and distribution, which I think warrants another row in your (otherwise outstanding) comparison table: specifically, availability. I live in a small town in northern Portugal and many of the desks you review are simply not available. I just chatted with the support people from Uplift about shipping costs for the Uplift 900 Base-Only (no desktop) and it was $300! In contrast, despite my remote location, I’m half an hour’s drive away from an Ikea that stocks these (according to the website, there are 3 in stock). That plus the ability to take it back (note ‘take’ not schlep to the postoffice and try and wrap it up) if it breaks within 10 years, is a pretty compelling plus. Not suggesting your review is unfair, but for those of us outside of the continental US, the comparison criteria are different. I hope your Seattle store gets it soon, so I can reap the benefits of your thorough reviews before buying. Curious if you have had an opportunity to physically review this Ikea desk? I checked out a floor model at my local store, and was told that this comes with a 10-year warranty. I just purchased a Bekant sit / stand desk at a Canadian Ikea. I read the warrenty for the Bekant and Galant desk systems and discussed it with the department manager. The ten year warranty includes the Bekant sit / stand and all its major components. I think your negative review is doing a great disservice to your readers and to Ikea and seems to be based on heresay and not checking with Ikea. I read the warranty that includes all Bekant desks. By the way I inspected the desk. The motor is quick, quick enough, and supporting 200 pounds is far more than the maximum of 75 pounds for a Mac Book Air, Imac, and printer that I shall put on it. And since distribution is so good I can drive it home in my hatchback saving the $100 shipping fee for most of the desks that your recommend. So the $500 US price, free shipping, and 10 warranty which matches the best warrenty on all of your desks make this one a clear winner. Finally the 63″ length is fine to fit a TR5000 DTE 3 treadmill and a ball to sit on – or a stool that can be place either on the treadmill or beside it. I’m thinking of buying the Ikea sit stand desk for both home offices and wondering if you “actually” raise it to use the stand up part? Any regrets on buying it or are you loving it? Any comments about it would be appreciated in helping us make the right decision. I have pasted in below the email response to my inquiry about warranty on the Bekant Sit / Stand table – everything is under warrenty for 10 years including the electric motor. Thank you for contacting IKEA Canada. In regard to your inquiry, please note that the warranty of the BEKANT/GALANT systems covers defects in material and workmanship on all main parts in the BEKANT desk series and GALANT storage system, from the date of purchase at IKEA. The electrical parts are covered under this same warranty. Please note that the original purchase receipt is required as proof of purchase for any warranty claims. If you have other questions or concerns, please do not hesitate to contact us. Thank you for choosing IKEA for your home furnishing and decoration needs. Thanks for your comments, Ken. When we first researched our review of the Bekant, the U.S. website showed a substantially different warranty. We have subsequently verified with IKEA that they do offer a 10-year warranty on the Bekant and have updated the review to show that. They still don’t stock the Bekant sit-stand desk at our local (Seattle) IKEA location, so we haven’t been able to actually look at the desk yet. As soon as we are able to physically examine the desk we’ll update the rest of the details of the review. Knowing what it takes to manufacture a sturdy and durable (two important qualities in any sit-stand desk) product, we remain skeptical that the Bekant will rise in our evaluation above the low end of the sit-stand desk spectrum. Reviews we’ve seen online have expressed concern about lifting capacity. We also want to see how stable the desk is at its highest adjustment; other adjustable-height desks with one-segment lifts like the Bekant’s become unstable when elevated all the way up. We’ll look at these and other features as soon as possible and revisit our review if we learn anything new.